If you’re anything like us, simply admiring a finely crafted piece is not enough. Not only do we want to know how it’s made but we are always willing to roll up our sleeves and try our hand at making it for ourselves. So as our Made in London season draws to a close, it seems only fitting that we pull together a guide to ten of the city’s most exciting craft aficionados. From pop-up sessions to evening classes, one-day workshops to qualified courses, these master makers are the go-to for anyone keen to get crafting. Taking the ‘make, do and mend’ philosophy very much to heart, Blackhorse Workshop is an open access wood and metal workshop situated in Walthamstow. The fully equipped space is staffed by a team of expert technicians and is available to rent for half a day or you can sign up for an annual membership. For those less adept with a power saw, Blackhorse Workshop also run a number of courses and workshops covering the basics of woodworking that range from a one-day introduction to more comprehensive classes spanning five evenings. Peckham-based The Kiln Rooms is a communal studio that seeks to provide a platform for professional ceramicists. Spread over two studios, which are conveniently situated just around the corner from each other, this community of makers offers professional development to its members as well as classes aimed at beginners and master makers alike. While you may not be familiar with the term risograph printing, it’s likely that you will have already seen the work of Hato Press as part of exhibition graphics at the Tate, Design Museum and V&A. Capturing the warmth of analogue prints through the use of a digital printer, risograph printing is an easy, environmentally friendly and cost-effective way to create multilayered artworks. Based in Hoxton, you can work with their team of printers to realise a riso project or learn the basics through their design, publishing and production workshops. A working upholstery studio, Shoreditch Design Rooms are specialists in all things furniture and fabrics. Priding themselves on a playful and personal approach, the studio’s master upholsterers have gained a reputation not only for their work with interior designers and architects but also as one of the country’s leading upholstery training centres. Whether it’s a taster course in caning, embroidery and cushion making or a full qualification you are after, Shoreditch Design Rooms is the perfect place to learn. If you’ve ever fancied yourself as the next great figurative artist, the Royal Drawing School is just the place to sharpen your skills (and not to mention your pencil). Studios are spread across the capital in Shoreditch, Oxford Street and Trinity Buoy Wharf with the institution offering over 250 flexible courses in life drawing, etching or even the art of comics and graphic novels. 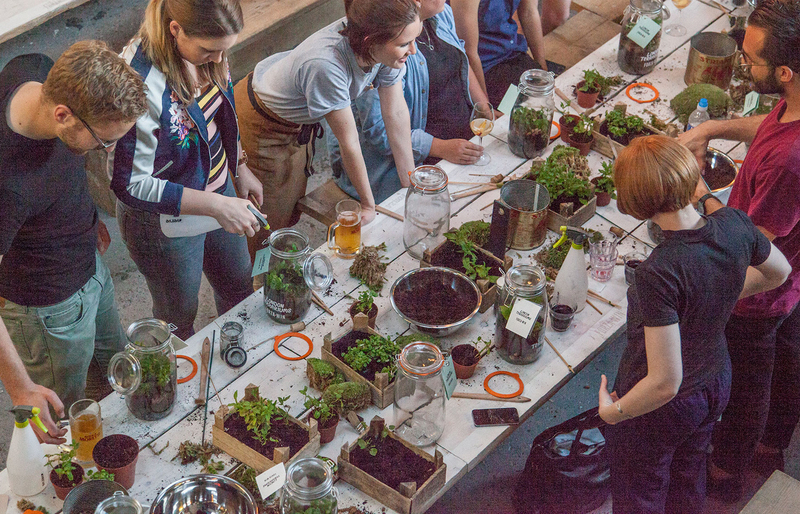 For those keen to bring some greenery into their home, a workshop with London Terrariums is a must. Masters in the art of bottled gardens, this growing botanical business is soon to launch its first store in New Cross with owner Emma having just penned her debut book. The studio itself is based in Bermondsey, however, the bumper schedule of workshops take place across the capital in a host of trendy locations including Heal’s stores. Lovingly handcrafted by Sophie, Grain & Knot produce a range of sleek wooden goods for the home. When she’s not busy whittling away at her home studio, Sophie spends her time travelling across the capital hosting her pop-up wood workshops, which includes spoon and butter knife carving using reclaimed timbers. Founded by east London jewellers and best friends Katie Woodward (a.k.a. Crux London) and Kirstie Maclaren, The Workbench helps would be designers carve their own solid silver ring. Fusing their creative flair and technical know-how, the pair has found a niche in the ever competitive world of pop-up workshops by producing a DIY kit that lets you create your own design. Master bakes are a piece of cake when you’ve got the expertise of the Bread Ahead team by your side. Located in the heart of the foodie mecca that is Borough Market, their bakery school is the perfect place to hone your baking skills with a mouthwatering array of courses including sourdough, patisserie and doughnut workshops. Raise a glass to Brixton based London Beer Lab. Demystifying the craft behind your favourite tipple, this open source micro brewery have plenty of ales to tell with beer making workshops for individuals or groups of up to six people. Well if you’re going to plan a Saturday afternoon out with friends why not make it a boozy one? For more hands-on workshops, designer talks and craft themed parties, make sure to check our roster of events.